Simplicity, utility and elegance are the key words underlying Scandanavian interior design. A Scandanavian interior is pared back, neutral in colour, and makes extensive use of organic materials, particularly wood, a naturally abundant resource in Scandinavia and one which has excellent insulating properties—important in those cold Scandinavian winters. Light, and making use of it, is very important—again, think of those long, dark Northern nights and grey winter days when little natural light is available. Blond wood, white walls and white or muted greys and browns all help to reflect available light, and create a bright and airy space, whatever the weather outside. Clean lines and minimal clutter are also important, again creating a sense of light and air. Furniture is practical and its design is restrained, yet there are elements of playfulness and whimsy too. Environmental considerations are to the fore, with furniture built to last from eco-friendly, natural materials. Wall to wall carpeting never really took off in Scandinavia, so if you want to achieve that Scandi style wooden floors are they way to go. Flooring can be in light, blonde wood, or washed in a cool grey; pine, ash and beech are popular choices. The Danish concept of 'hygge' is sometimes translated as 'cosiness', but it's much more than that—it's about creating a nice, welcoming atmosphere and enjoying the good things in life with good people around you. An expansive dining space in which to entertain friends and family is, then, key. Clean lines and minimalism still prevail, but add touches of character with pops of colour in the table settings and decoration. While the base palette should be kept neutral, colour is an important element of a Scandinavian interior. Cool blues and greens are popular, but flashes of bright primary colours like red and yellow are also common. While walls, floors and large pieces of furniture shouldn't stray too far from a neutral colour scheme of white, light grey or beige, cushions, rugs, artwork, candles and accessories should provide visual interest and traces of whimsy to contrast with the overall restraint of the interior design. Lighting is very important in a Scandinavian interior—mirrors can be added to amplify natural light, while lamps should brighten every corner. Add warm touches of light throughout the room, using candles or fairy lights. Lights can add those essential pops of colour to a neutral Scandinavian interior. These cute lights from MamaUrsula tick the eco materials box, too, made as they are from felted wool. Monochrome is also a feature of Scandinavian interiors—black picture frames or lampshades create a wonderful contrast with clean white walls. Very clean lines, and clutter-free spaces are crucial—baroque ornamentation, whether in furniture or accessories, is foreign to the Scandi aesthetic. Add touches of softness to all those clean lines with accessories made from organic materials—like a wool pouffe, or shaggy throw. Functionalism is a crucial guiding principle of Scandinavian design. While furniture should be beautiful and elegant, it must also be strictly utilitarian, and ideally, built to last. 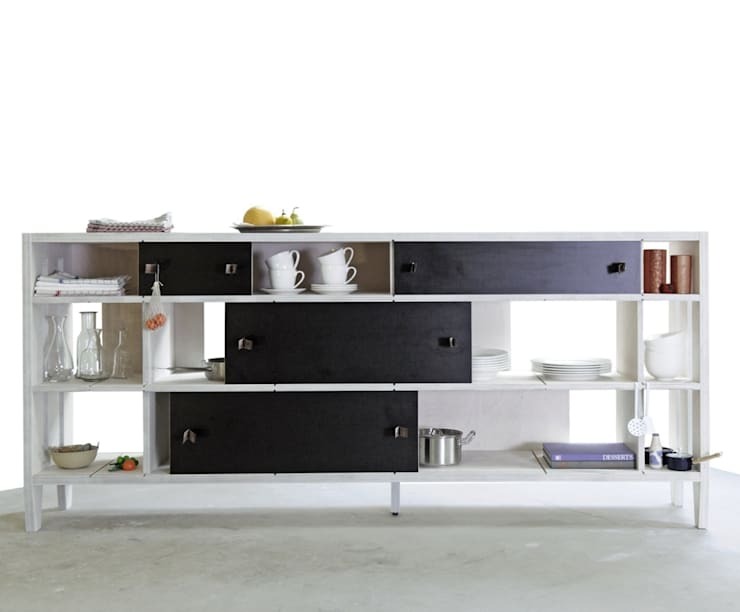 Multi-purpose pieces with clever design—as seen in the sideboard pictured, which could as easily find a home in a living room or hall as in a kitchen, will add that Scandi vibe to your interior. 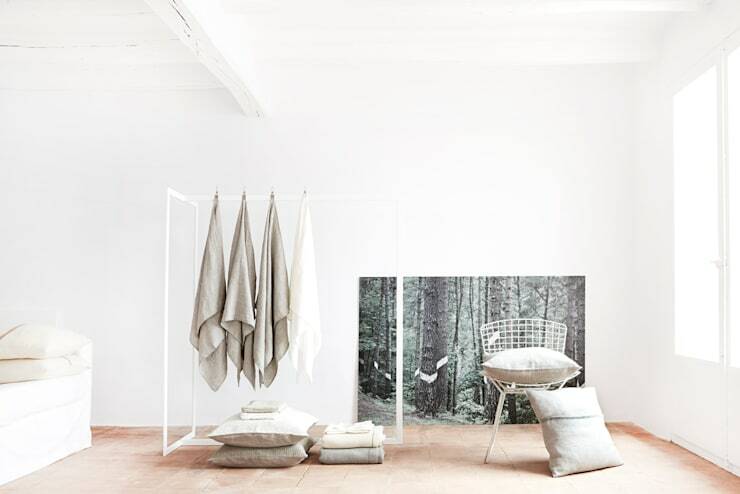 Wool, pure cotton, and linen are your go-to textiles for a Scandinavian interior. Organic, soft, and soothing, they are in keeping with the eco-principles of this style of design, and help to create a natural, liveable feel. Cosy things up with a sheepskin rug or throw, as seen below.